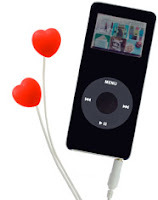 Rock out with your... well, with your heart-shaped earbuds visible, okay? This is a family blog, after all. From Fred Flare.